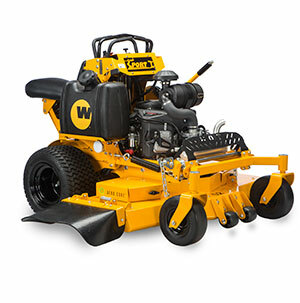 Wright Manufacturing will introduce a new 36-inch Sport Intensity mower at GIE+EXPO in Louisville, Ky., Oct. 19-21. The Sport I’s fold-away seat is positioned so the operator can quickly step off, in which case the mower stops immediately. An operator presence switch on the foot platform stops the blade and engine, and the control levers return to the neutral position when the operator lets go. All three engines–18.5 hp, 19 hp and 22 hp–deliver a top speed of 8.2 mph, and the Sport I is covered by Wright’s two-year limited warranty. Wright’s floating Aero-core deck on the Sport I tilts side-to-side and front-to-back, allowing the mower deck to better follow the terrain contours. It also improves the weight distribution for better handling on hills. The deck height can be adjusted “on the fly” in quarter-inch increments, and anti-scalp rollers automatically adjust the deck height to changes in terrain. Elastopolymer bumpers provide a dampened feel similar to a car. The bumpers are progressive to accommodate the weight of various operators. Test drive the Sport Intensity at Wright’s outdoor booth, 7624-D, at GIE+EXPO or in the exhibit hall at booth 3094.